Are you in two minds about buying Relaxonchair’s Zero Gravity Shiatsu? We’re here to help with this comprehensive review of a great value-for-money massage chair. The Zero Gravity Shiatsu from Relaxonchair is a terrific product with its zero-gravity, heating pads and body scan features. Considering the benefits you’ll get from this chair, it’s actually better than most brands with higher price points. It’s small enough to fit in small apartments but big enough to ensure your comfort. One slight downside in this product is its foot rollers, which can be a bit too tough. The problem, however, can easily be resolved if you have an extra pair of socks (which you probably do) available at home. Relaxonchair markets affordable massage chairs with ergonomic designs and quality materials. It offers White Glove Service where its delivery men take responsibility for the product’s transport, assembly and clean-up for an extra cost. The Zero Gravity Shiatsu comes with a limited 3-year warranty. Parts will be covered during the first year and labor isn’t included. As for the framework and structure, they are covered for at least 2 years. Keep in mind that the warranty applies to residential users only. Commercial use of the product automatically voids the warranty. Unlike some rival chairs, this product has a computerized control panel that sits on a stand on the left side of the armrest. Although it looks overly technical, the control panel is actually easy to use. It’s also big enough to see and understand even without your eyeglasses. It comes with 4 different programs and 3 manual techniques and intensities. You get to decide on how fast or strong you want your massage. Here’s a quick look at the handy controller. This feature is one of the few things that set this chair apart from its competitors. By pressing this button on the control panel, this Zero Gravity Shiatsu massage chair will do a body scan to measure the length of your spine using its L-tracking system. The feature helps give you a more accurate massage by pinpointing the exact locations where a massage is needed. No more shifting from time to time just to hit the right spots. The Zero Gravity Shiatsu massage chair can fit best through doorways measuring 36 inches. If yours is a bit narrower, say around 32 inches, a good solution is to remove the hinges. It has a big seating space at 29-inches by 50-inches. 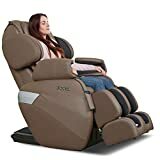 The Zero Gravity Shiatsu is one of those massage chairs that can literally put you to sleep with its ability to fully recline to a lying position. It has individual air bags that can inflate and deflate to stretch your body and relieve tension around your neck, shoulder and leg areas. It provides a good and relaxing massage to the hip area as well, especially with its two heating pads for your lower back. Unlike most chairs that come with zero-gravity technology, this one doesn’t take up too much space. In fact, it only needs a three-inch clearance from the wall. Its chair slides forward as its headrest moves downward for a new zero-gravity experience. Its ability to elevate your feet to the level of your heart is also a nice feature to experience, especially if you’re feeling a lot of discomfort on your lower back. This massage chair may not be for the fainthearted as its rollers, particularly the foot rollers, can be a bit strong. It can make you feel sore right after. To lessen the intensity, placing shoe inserts in the foot rest might do the trick- or you can wear your socks or your light house slippers. Although the product comes with a three-year warranty, it isn’t as comprehensive as you’d expect. Parts will be fully covered only during the first year while the warranty is extended to the structural framework of the chair for two more years. And that’s not the only issue. Aside from this confusing warranty coverage, you’re also expected to shoulder the shipping cost of your chair to the repair center in case it gets broken. Having said that, it’s actually quite generous compared to some other massage chair warranties. The Zero Gravity Shiatsu is a good choice if your budget is more than a thousand dollars. It has a lot more to offer than most chairs with the same price tag- or at least it does things better. If you can get past its tough foot rollers, you’ll find that this chair can really give you a worthwhile massage experience.